Here are some favorites from Lindsey's senior portrait session! A few weeks back Logan and I got to hang out with Ryan and Kristen for their engagement session. These are two of the most fun loving people that you'll ever meet with hearts made of pure GOLD. I have to mention, the proposal was so epic you'll be sure to smile the entire time you watch it, that's right, Ryan (with the talents of Exodus Media) made a video and you can watch that here! We shot in the heart of downtown Warren, where urban street-scapes and historically beautiful character come together to make for one diverse backdrop. Kristen and Ryan are literally a perfect match, and you will notice that just by watching them together. Logan and I are so excited to shoot and celebrate with you two this November! Their joy is the kind you don't just see when you're with them, you feel it too. Sometimes rain can be magical, just ask Kristen and Ryan! These two braved the pouring rain with us and we ended up having so much fun with it! SO worth getting soaked!! We continued Kristen and Ryan's engagement shoot a few days later on a bright sunny morning. Total opposite weather but I'm happy that we had so much variety for their sessions! Danielle and Joel, two of the most fun people you will ever get the chance to meet! Their love story is so good too. They met through a mutual friend and as a group went to Chili's one night, essentially a blind date. A month later they started dating. Fast forward to the proposal. Danielle was on a girls trip in Chicago to visit a college friend. The girls were walking through Oz Park, when strolling towards them is Joel! He drove all the way to Chicago for one epic surprise. He then gets down on one knee and asked Danielle to marry him! Danielle was SO caught off guard that he was even there, her friends (in on the surprise) crying tears of happiness for them. Joel drove home that same day, now THAT'S a girls weekend she will never forget. I'm so thankful that we have the joy of capturing such fun couples on their wedding day. That we get to know them and spend time with them for sometimes over a year before thier wedding. Danielle and Joel's day was nothing short of magical and we are so happy for them, truly. They started as clients, and now we call them friends. Here is a peek into their Great Gatspy Inspired wedding day! Adam and Laurissa's wedding day was perfect in every way imaginable. The love that they share is genuine and heartfelt. The way that they honor each other is not just seen but felt in the gentle way they are when they are together. Surrounded by their family and friends, they got to celebrate the best day of their lives. I'm so happy to share some of my favorite images and tell the story of their day with you all. Congratulations Adam and Laurissa Shaw! One of my favorite aspects of Adam and Laurissa's wedding day was that it was filled with their love for Jesus. I shot these images as Kristen (one of Laurissa's bridesmaids) covered them in prayer... I was in the editing process and couldn't help but notice the image of the cross in the window pane. WOW. Ok, i've decided shooting proposals are my new favorite thing. Last weekend we had the honor of capturing our friends getting engaged and seriously, it was AWESOME. Even better: Lydia had NO IDEA, like, none. Zero. So it all started about a year or so ago, these two had an budding little thing for each other and we've been able to watch their love grow since then. I remember specifically being on vacation with the Tarleton's (Brad's family) and I think Brad and Lydia texted each other more than I text Logan in a whole year. ;) LOL. Brad had secretly planned the entire proposal by telling Lydia that his grandma (grammy) wanted to take them all out to dinner. He went to Lydia's house to pick her up and take her back to his parents house where she would come to find that it was all an elaborate scheme. They weren't going to dinner, but he was going to ask her to be his bride instead. So, here is it! The proposal. Lydia is an extremely talented artist, she made this portrait as a gift for Brad. The proposal took place on the back porch of his parents home, where he grew up. Brad custom designed Lydia's ring, with a pear shaped black diamond in a rose gold setting. It. is. gorgeous. You can visit the jewelers website here. Brad had everyone park their cars down the street and surprise Lydia when she came in the house! There she found their families and friends waiting for her. The reaction of pure joy is priceless. She was new to the real-estate industry, recently hired to join the Burgan Real Estate Firm. She was invited by her new boss to her first work party, a Christmas Brunch at their home. She was SO excited to meet her new co-workers, one of them particularly showed up a little later than everyone else, was really outgoing and she thought... "he's must be trying hard to be funny." That guy was her new boss' son, Patrick. Lindsey asked Patrick to get drinks one night so she could pick his brain on how to get her real-estate career started. They talked real estate for about 10 minutes, but sat there laughing and talking for FOUR hours straight. She was drawn to his sense of humor and loved that they could just laugh at silly things. They knew by their third date they were meant for each other. He knew then that she was going to be the girl he would marry someday. 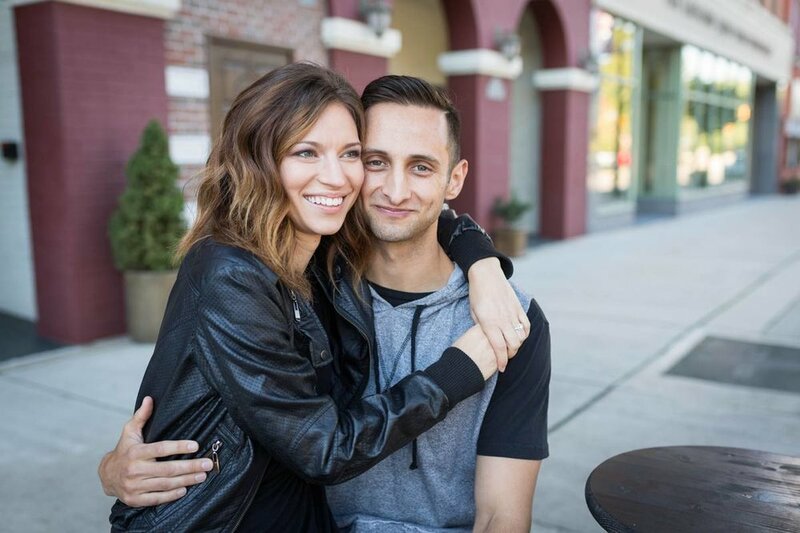 Last fall Patrick asked Lindsey for her hand in marriage, and they are planning a gorgeous October wedding this year. Guys, I'm so excited to share this engagement session with you! Special thanks to Stacey Rzonsa for connecting us to such an awesome, fun couple. We are truly honored to capture your special day. Patrick and Lindsey's pup, Bobo, is a huge part of their lives.. so we HAD to include him. He kept us laughing for the entire session. Lindsey looked so beautiful, her makeup was done by Jen Melia at The Makeup Boutique. We took a little drive over to the office, I loved that we included a piece of their history into the session. They met years back where they both attended Allegheny College. He was the quarterback and she was the girl with the gorgeous eyes. The rest is history! We spent the day up in Chagrin, Ohio where Molly's family lives. The day was perfect, 65 degrees (in Feburary?!) and the warmth from the sun made if feel like a spring day. We are so excited for these two as they begin their journey together! I can't believe that we are about to say goodbye to another year! 2015 was definitely a growing season for us. It was our first year shooting weddings, it was our first year in business *together*, while trying to navigate between day-time jobs and photography. All of those things came with its challenges. (and maybe tears too ;)) We pushed through and with God's provision I was able to quit my day job to pursue photography FULL TIME! It was a huge step in my life personally, but we knew that It was what was going to be best for us professionally. We experienced a huge loss, and by Gods grace, overcame. The outpouring of love that came from so many loving clients (and now friends) seriously makes my swell. These couples are some of the most incredible people that i've had the privilege of having in front on my lens. We can't wait for 2016 and to capture and watch all the love stories that will take place, the best is yet to come guys! Well this years Christmas mini's were quite the success. We had the opportunity to connect with family, friends, old co-workers, you name it. We also go to meet some new faces, which makes my heart so full! We really had such a great time with everyone. Here is round two of the sneak peeks for this years Christmas Mini sessions! Holiday Mini's are here!!! This is seriously one of my FAVORITE things to plan. I also love an excuse to hunt for things at the thrift and thats usually where I find the best treasures with some character. The theme this year was campfire Christmas, complete with a tee-pee! (incomplete without the campfire but thats besides the point, lol) I love all things boho and rustic right now so I wanted to incorporate those two elements into my mini theme. The kids loved the tee-pee so that is a win in my book. We started bright and early Saturday morning and headed out to Canfield, Ohio to Paradise Hill Tree Farm. Mr. Williams was so incredibly nice and welcoming, we are so appreciative for letting us shoot all day on his property! Round 1 of mini's consisted of ten families! I can honestly say, we are blessed with the best clients. Both old and new! We had the best day with everyone and It couldn't have been better. I'm so excited to share a few from each family with you guys! I hope you enjoy! That little holiday can came from my grandparents home after they passed away, same as the suitcases. No idea how old it is but i thought it was kinda neat! Gia literally "nay nay'ed" for all of her photos!!! lol.